R Dauntless Dominate Dragon "Reverse"
Okay, that's a LOT better. Dauntless Dominate Dragon "Reverse". His Limit Break is that you can CB1 and lock a Kagero rear-guard to allow himself to retire an opponent's booster whenever he drive checks a Grade 1 or above for that turn. When that happens, he also gets 3k until the end of the turn. This card's pretty neat. He's like Vowing Sabre Reverse in that by screwing himself out of one column, he makes up for it by murdering more physical cards, forcing the opponent to put down more and thus lose their opportunity cost of the replacement's shield. Not great, but also not terrible compared to other Reverse costs I've seen. That is of course assuming he comes first. Obviously he's a Crossride unit for Dauntless Drive Dragon as well, and pulling this combo off allows Dauntless Reverse to either eat the opponent's boosters or check a ton of triggers. Either works since the Break Ride alone means Dauntless Reverse won't need a booster this turn. He's probably going to be popular if only because it's Dauntless and it's awesome, and he just got a new card to play with. Otherwise, if he comes first, just remember to lock his own booster unless you have one column who can only force 5k attacking an opponent's Vanguard but can still attack an interceptor. Nanya Dauntless Dominate Dragon "Reverse"
Thanks for losing to Kai, Miwa. That is some serious artwork on this thing. I mean, look at it! It's basically going "give me a hug! I want to embrace you so you can join me in the Reverse!" Who wouldn't want a hug from this thing? 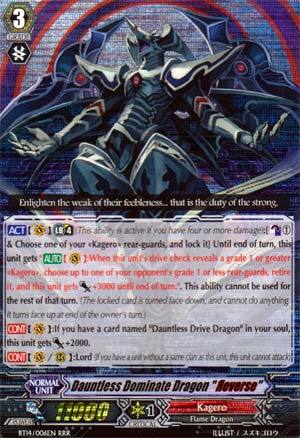 Dominate Dragon is a cross ride for Dauntless Drive Dragon, pretty obvious from the name, I think, so, +2000 for that. As a plus, since Dauntless is a Break Ride, that makes this thing a lot better. Okay, now for the Limit Break, a single Counter Blast and a lock of one of your rearguards basically turns this card into Goku using a Kaiohken (Kaioh-what?) on your opponent. Any time you drive check anything that's not a trigger, you retire a Grade 1 or less rearguard that your opponent has, and this card gains an extra 3000 for the turn. If it's on the Cross Break Ride, your opponent has to deal with a Restanding Vanguard that will swing in for at least 24000, if not more, twice in one turn, that retires their rear guard boosters. Over-all, this is a solid Kagero card to use and if not for Nouvelle Vague, this would be almost as pricey as Minerva is. As it is, you can get this one on the cheap and have a pretty good deck as well. On top of it, it's got its own Dauntless support in the set. Honestly, as of right now, the only decks for Kagero that are worth running, until the next set, is Dauntless Reverse, Nouvelle Vague and Overlord The End. Take your pick, they're all pretty good.